For this instalment of the crime fiction alphabet we’re heading to a location in America that has become well-known to readers (and watchers) of crime fiction. Quantico is actually a small town (population 561) in Prince William County, Virginia but for crime fiction readers the name generally conjures up images of one of the military or law enforcement facilities that surround the town. It is the site of US Marine Corps’ largest bases and contains within it (among other things) the Marine Corps Officer Candidates School, the Marine Corps Research Center, the Marine Corps Brig (a military prison), the FBI Training Academy (incorporating the much-featured-in-crime-fiction Behavioural Analysis Unit) and a training facility for the Drug Enforcement Administration (DEA). Collectively these facilities and the people who work in them have become familiar to crime fiction fans. One of the first books to feature Quantico in any detail was Thomas Harris’ Silence of the Lambs (published in 1988 though set five-years earlier) in which a young FBI trainee, Clarice Starling, is asked by Jack Crawford, head of the psychological profiling unit, to present a profiling questionnaire to Hannibal Lecter, a sociopath serving life in prison for a series of brutal murders he committed. As well as being in charge of building up profilers of all the worst killers in custody, Crawford is also on the trail of a serial killer who has been nicknamed Buffalo Bill who has killed several women in a particularly gruesome way. It becomes clear that Lecter knows something about the killer and a battle of wits begins. Given that several characters in her long-running Kay Scarpetta series work for the FBI in one way or another, it’s no surprise that more than one of Patricia Cornwell‘s books features Quantico in some way. In the fifth book of the series, The Body Farm (1994), Scarpetta is investigating the murder of a young girl which has similar elements to earlier murders which were carried out by someone who has eluded the FBI. Kay is helped by her niece, Lucy Farinelli, who is now an intern at the FBI and looks set for a career at Quantico’s computer engineering facility before she engages in a disastrous relationship with a fellow Quantico employee. 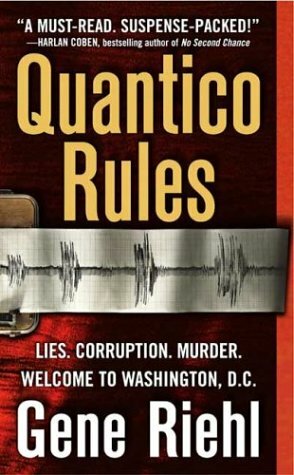 Gene Riehl’s Quantico Rules (2003) is a bit of a departure from the serial killer hunts that tend to be the focus of novels in which the Quantico facilities are featured. Puller Monk is an FBI agent along with being a compulsive gambler and jolly good liar (he actually practices defeating lie detectors). He heads up the Special Inquiries (SPIN) unit and as the book opens is undertaking a routine (but thorough) background check of Judge Brenda Thompson who is the first African American woman nominated as a candidate for the Supreme Court. He learns that she has lied about what she was doing during a 3 week period over 30 years earlier and when he follows that lead a very nasty secret starts to unravel. It’s also worth re-mentioning the book I featured for the letter Q the last time this meme was in play. 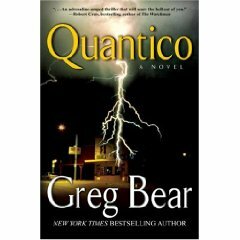 Greg Bear’s Quantico (2007) is a cross between science and crime fiction. It is set in the near future when a massive terrorist attack has occurred in the US and the book follows the stories of two Quantico-based FBI agents, one a Muslim of Arabic heritage and one a man trying to live up to the legendary status of his father. P.D. Martin‘s series featuring Australian-born FBI Profiler Sophie Anderson starts out with Body Count (2007). Sophie has left her job with the Australian police to join the FBI and when this book opens she has undertaken her training and is working at the Quantico-based Behavioural Analysis Unit. She starts experiencing nightmares of crime scenes. This would be fairly normal for a law enforcement officer except these are detailed images of real scenes that Sophie has not been anywhere near. Is she going mad or does she really have a capacity to see things from a killer’s point of view. Many crime other crime fighters, such Leighton Gage‘s creation Chief Inspector Mario Silva of the Brazilian Federal Police who features in five books so far starting with Blood of the Wicked, spend time training at Quantico either as part of the narratives in which they appear or via their back-stories so the facilities really are an almost ubiquitous feature of crime fiction. Is this a feature of crime novels you have noticed? Have I missed your favourite Quantico-based book? This entry was posted in Crime Fiction Alphabet, Gene Riehl, Greg Bear, Leighton Gage, P D Martin (Aus), Patricia Cornwell, Thomas Harris. Bookmark the permalink. Bernadette – An inspired choice! I’m impressed :-). I like it quite a lot, and you’ve chosen several books I like very much that are based there. Margaret Truman’s Murder at the FBI also features some Quantico action, although it’s based more at FBI headquarters in Washington D.C. than at Quantico. Still, it figures into the story. Clever post – I like it! I haven’t read any books based in Quantico, although I have seen the film The Silence of the Lambs. At the time I had no idea it was in Quantico, most likely because I was traumatised by Anthony Hopkins’s performance as Hannibal Lecter. The Johanne Vik/Adam Stubo series by Anne Holt features Quantico, at a distance. The series is Norwegian but Vik has lived in the USA and has worked for the FBI – traumatic events have occurred in her past which aren’t very clear in the first two (translated) novels but are a bit more explicit in the third,Death in Oslo, in which the US president (a woman of Norwegian ancestry) visits Oslo and is kidnapped. Quantico is a recurring theme but from memory the books don’t have any actual settings there (although the second novel takes part largely in the USA). The novels are listed/reviewed at Euro Crime if you are interested in following up. I really enjoy them but somehow they don’t quite deliver on their potential. PS, sorry, should have noted that Vik is, or was, a profiler trained by the FBI but has quit due to aforementioned trauma. She has a disabled child whose father has left them, and a new baby, so feels her hands are full on the domestic front for the time being, but keeps getting called back in by the Norwegian police (cue Stubo) to profile cases when they get stuck. Though I have grown tired of Cornwell later, I really liked Body Farm. Offhand I don´t remember other Quantico books than that one plus the Anne Holt series Maxine has already mentioned. I like the series, but as I have mentioned before, Johanne Vik was rather whiny in the first two. Stubø is much better.